The Little Plum Lutheran Cemetery sits behind our property. In accordance with state laws, a cemetery that once was part of a church cannot be owned by a private party. There are easements in place to allow visitors to cross farmer Ericson’s slice of land, use our driveway and then walk to the cemetery. We typically have weekly visitors during the ‘season’ (late March to the first heavy snow in December). 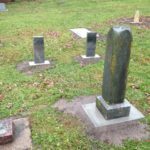 The outgoing church board hired Johnson Monument Company this fall to repair and reset a significant portion of the 100 head stones in this little country cemetery. When we are home, we make it a point to come out and say hello and answer any questions. The church has asked the Township of Frankfort to take over the management and care of the cemetery. Ricky and I keep a close eye on our very quiet neighbors. Rather than putting up fences, I planted a living fence of day lilies, irises and rosemary. As the monument company cleared in ground plants, I re-purposed more lilies and peonies planting over 200 plantings at the cemetery’s borders. In a couple of years it should be lovely.